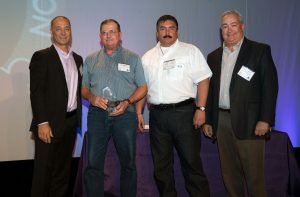 Peak Oilfield Service Co.’s Joe Warchola and Sam Pruneda (center), pictured with Andeavor leadership Paul Carlson and Phil Anderson. Anchorage, Alaska – Andeavor, formerly Tesoro, selected Peak Oilfield Service Company as one of eleven suppliers recognized during Andeavor’s Supplier Recognition awards banquet in San Antonio, Texas on September 10, 2017. Peak was recognized at the event for its superior safety performance while drastically improving the efficiency of processes through ideas and suggestions at Andeavor’s refinery facility in Nikiski, Alaska. Peak has been Andeavor’s “contractor of choice” for operations and maintenance services at the Kenai refinery since 2007.